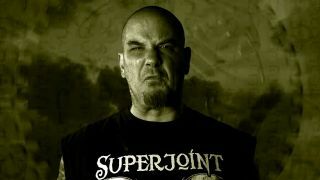 Phil Anselmo’s Superjoint have released a video for the title track from their new album Caught Up In The Gears Of Application. The band released their third album this month and the promo for the title track can be viewed below and at the top of this page. The Caught Up In The Gears Of Application video is directed by Kate Richardson and was filmed and edited by Mike Holderbeast. This week Anselmo said he is more creative than ever after quitting drinking and that he currently has up to five other albums in the works. He said: “I’m sitting on tons of music. Right this second, I’m working on three different records. I’ve got so much stuff. It could be four or five. Anselmo said he isn’t sure whether his stockpile of new material will be released as Superjoint music or via his solo band, Philip H Anselmo And The Illegals. He also discussed his daily battle with physical pain in his knees.